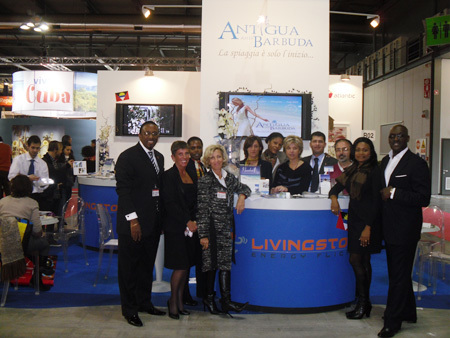 February 18, 2010 (Milan Italy) - Livingston airlines will significantly increase its direct charter flight services to Antigua and Barbuda from Milan, Italy this year. The agreement to extend the weekly charter was the outcome of successful discussions today between the CEO of the Antigua and Barbuda Tourism Authority Colin C. James, and CEO of Livingston Airlines GianCarlo Celani, at BIT, Borsa Internazionale del Turismo (International Tourism Exchange) , the largest Italian Tourism trade and travel fair in Milan. “This news will be welcomed by the Italian tour operators and local hotels who over the last few years have been clamouring to get the service extended” said James. He indicated that, the new extended charter schedule will commence on Sundays and now allows the destination to actively target the Italian wedding and honeymoon market. Livingston's CEO who has never been to the destination graciously accepted an invitation from James to not only visit Antigua and Barbuda but, also committed to providing free seats for a mega FAM and press trip to help promote the destination. Last year, The Ministry of Tourism’s statistics showed a growth of 9.68% from the Italian Market, in spite of the global declines in other markets. The once a week charter which commenced this season's service in November 2009 would usually run until April. Service has now been extended to run until the 1st week in September. Livingston also committed to resume its winter schedule even earlier than previously at the end of October this year. BIT which runs from the 18th to 21st February allows tourism related entities to meet members of the trade and the public. This year, Jolly Beach Resort and Spa, Elle Colonna, Elite Island Resorts, The Inn at English Harbour and Hermitage Bay jointly participated with the Antigua and Barbuda Tourism Authority in promoting the destination at the event. This positive development comes hard on the heels of the Donnavventura TV show which was recently filmed in Antigua and Barbuda and aired on Italian TV last weekend. The Antigua and Barbuda office in Italy has seen a rush of inquiries since the show's airing. Another Italian TV crew is currently on island filming for additional programs which will showcase the country's investment and tourism potential.